HUNTS POINT — Felix Acevedo, 18, lives in Hunts Point and says he is well aware of the problems the neighborhood faces, such as hunger and homelessness. "From Southern Boulevard to Lafayette Avenue and down, you see homeless people walking around, lots of them without a coat," he said, "And it's cold." These issues helped inspire Acevedo to spend Martin Luther King Jr. Day building a soup kitchen at a church in his community, in hopes that it will lead to improvements in the neighborhood. "We needed it. The community needed it," he said. "We can't give them everything, but what we can give, we give it to them." The soup kitchen will be located inside of Bright Temple AME Church at 812 Faile St. and is being created by volunteers with the Food Bank for New York City. Although the organization normally does projects in each borough for Martin Luther King Jr. Day, this year they are concentrating all of their resources in Hunts Point, according to President and CEO Margarette Purvis. "We decided we could make a greater impact," she said. "We'll focus all of our resources on one project of great significance to the city, to our mission, to our network, and Hunts Point has got to get more attention." Nearly one in four residents of Hunts Point struggle with food insecurity, despite living in the same neighborhood as the Hunts Point Cooperative Market, a massive food distribution hub, according to the Food Bank. Additionally, several residents are forced to walk for almost 30 minutes if they want a hot meal, as the closest soup kitchen is currently on the other side of the Bruckner Expressway, according to the organization. Rev. Sherwyn James, the pastor at Bright Temple AME Church, said he hopes to have the soup kitchen ready to serve meals by the end of January and anticipates that it will initially be open for two or three days per week from 11 a.m. to 3 p.m. He expects the soup kitchen to later ramp up production and be open for five days a week. "We're excited about the possibility of being able to positively impact the lives of so many people who are in dire need in our great city," James said. Purvis estimated that roughly 200 volunteers came to the church on Monday to help with painting, landscaping and interior design. 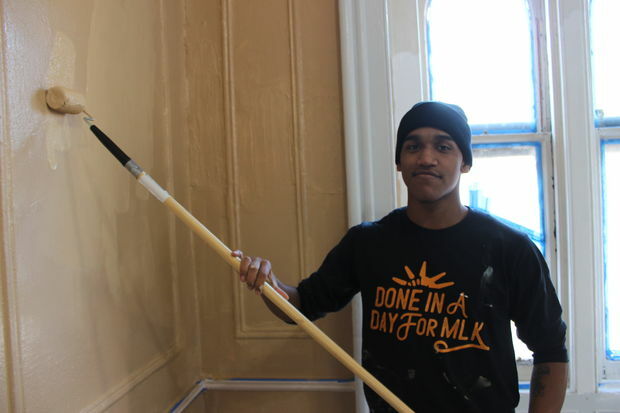 Efrain Morales, 16, volunteered with his mother and said Martin Luther King Jr. would have been a strong supporter of their project, as the soup kitchen would help promote greater equality in the city. "He wanted everybody to be equal, so this will help everybody to move up," he said. "It will help everybody improve their lives." His mother, Keyri Rodriguez, said she would have volunteered for the project regardless of whether it was Martin Luther King Jr. Day. "I think it's important people give back in some sort of way," she said. "This is my way of giving back." Purvis said volunteering was the best way to pay tribute to Martin Luther King Jr. and reminded people that this is why they get the day off. "The best way to honor Dr. King is through service. That’s why we’re actually off today," she said. "It’s really not to go shopping. It is so that you can serve."